Gomed stone is believed to be filled with energies of the strong planet Rahu. It is an extremely powerful gemstone and very useful for the people living in this era. It is also known as Gomedh or “Gomedak” in Sanskrit language. 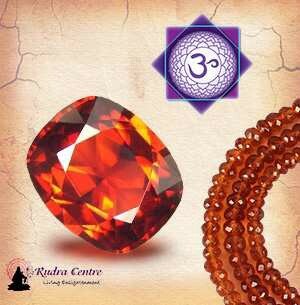 Hessonite is a type of garner which is used to strengthen Rahu. This brownish — Orange gemstone is very beneficial due to supernatural reasons. This gemstone is related to astrology and holds the powers to cure diseases. Wearing a GOMED at the time of Mahadasha or Antardasha of RAHU which is caused by shifting of this malefic planet from one house to another helps to get rid of the problems and miseries caused by this planet RAHU. Hessonite can also be worn by the people’s born in the month of January as a symbol of birthstone. It always benefits the person’s whoever wears it. It’s largest mines are found in Sri Lanka. A pure quality Gem hessonite is transparent or translucent, but cheap quality gemstones are opaque. Lower grade gemstones are not much beneficial. The honey colour of this gemstone is because of coloured impurities present inside it. They are not normally distracted from the stone but after polishing hessonite acquires glass like lustour. The Gomed stone is a very powerful gemstone according to Vedic mythology. It has many beneficial effects on a emotional, physical, and psychological level in humans. Gomed is a healer of Sarpa Dosha which is curse of snakes. This Dosha affects health and wealth of a being and Gomed if is suitable for him then it blesses and cuts the effect of Sarpa Dosha and it’s symptoms. It sometimes does miraculous effects on human’s lives. It also provides mental relief and stability. It improves our temperament. Rahu periods usually alters with confidence and health of humans and Gomed stone cuts this alteration and provides relief from all confusion. Due to Rahu effects sometimes Relationships also gets affected and sometimes it leads to break — ups. Wearing this magical gemstone can fix such relationship issues and give long term effects. This gemstone also helps to get rid of alcohol and smoking habits. There are certain diseases which are incurable and difficult to diagnose are caused due to bad shadows of Rahu. If the Gemstone Gomed is suited to the individual’s Graha’s it brings in relief and cures to many complicated diseases. Those persons who wears gomed Gemstone rings does not have fear complexes and are blessed with the self-confidence and the courage to take over any difficult thing. This magical stone also removed evil effects of black magic. Gomed stone also helps to flourish political careers and blesses with power, influence, health, wealth and success. It helps to win hearts of enemies and ensures victory. It makes mental condition stable and removes stress from the mind. Gomedh is very much beneficial for those who are suffering from skin diseases, piles, eye infection, nose infection, weird allergies, insomnia, cancer, gastric ailments etc. Hessonite always brings prosperity in the lives of it’s possessor. Hessonite is an extremely powerful gemstone so it should be worn only in specific conditions and only after consulting a astrologer. An individual should wear Hessonite gemstone if Rahu periods are operating and are positioned in the 2nd, 3rd, 10th, or 11th house of one’s Kundali. If you are planning to buy this gemstone then buy it on Saturday. The object on which it should be mounted should be open from one side to provide direct contact with bare skin. Hessonite stone price per carat depends upon Weight, colour, translucency, and Quality. Natural Hessonite price in India is between rupees 125 per carat to rupees 4,600 per carat and above and can vary place to place. Price of this gem varies from quality to quantity. Price of Hessonite is also dependent on the country of origin. Hessonite is found in Sri Lanka in abundance. This gemstone always brings good fortune with itself but if the Karma of previous birth is more then it works according with the Rahu periods. A gemstone is not lucky or unlucky. It all depends on the character of the person who wears it.